Sorry I haven’t been posting much — been busy at work these past two weeks. Click here to view a large-size version of the pic above. This was two ears of corn briefly sautéed in melted unsalted butter with minced shallots, a pinch of salt and some chopped tarragon. Remove from heat and stir in some diced tomato. The ricotta spread consists of 4 tablespoons sheep’s milk ricotta cheese, salt, pepper, extra-virgin olive oil and 1 teaspoon chopped lemon thyme. Combine all ingredients and stir until thoroughly incorporated. Can be made 1 to 2 hours in advance; chill in the refrigerator until ready for use. Spread ricotta on slices of grilled or toasted bread and serve. 18 Jul	This entry was published on July 18, 2009 at 6:38 pm. It’s filed under food, general, summer and tagged corn, fresh, ricotta cheese, seasonal and local, snack, tomatoes, vegetables, vegetarian. Bookmark the permalink. Follow any comments here with the RSS feed for this post. Yes, please. With a chilled glass of yummy summertime Rose. YES, YES, corn is JUST showing up at local farm markets…..NOTHING says summer like baby sweet corn. YES YES, I’m going to make your corn salad. Tonight! 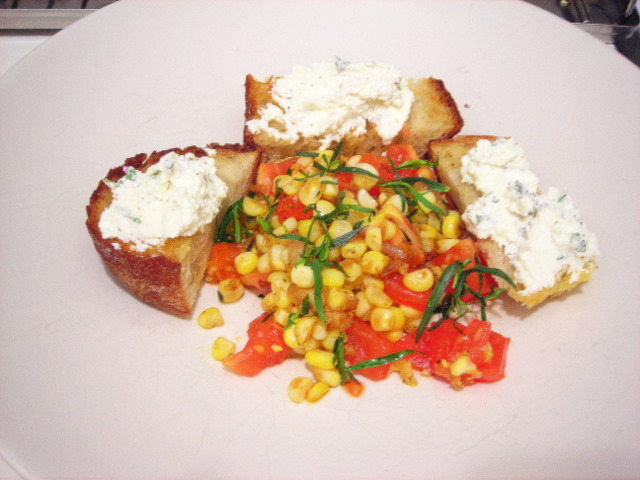 We’re going to have a mini-heat wave (for Oregon) this week, so a cool corn salad is perfect. Gorgeous snack! 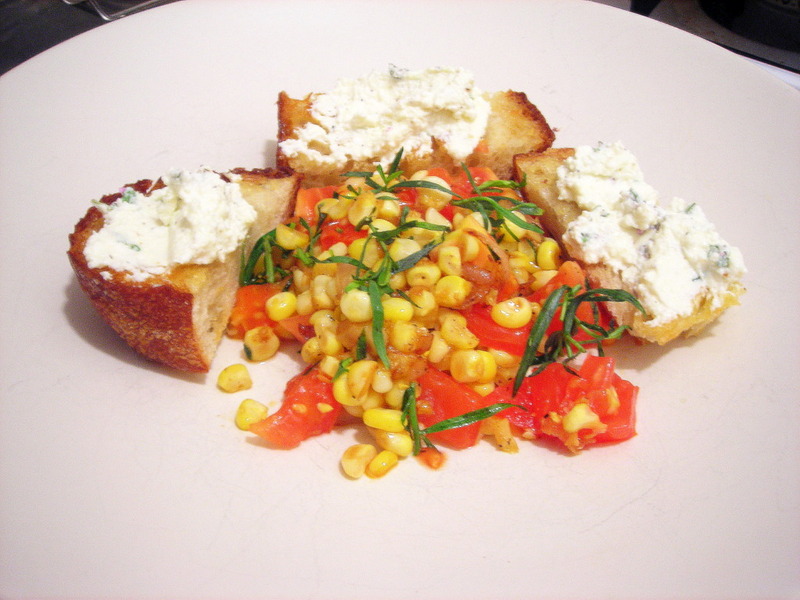 I love the combination of corn, tarragon, and tomatoes. Just lovely.